The local daily reports the death of Kay Longcope (byline Miguel Liscano), co-founder, along with her life partner, of the Texas Triangle newspaper (its successor publication is TXT). So far, only Editor & Publisher seems to have picked up this news, although Austin360 has a really good and characteristic photo. Kay and Barbara lived across the street and we mention them almost every day. Their successors as neighbors still maintain and care for the unaltered landscape that they created and made their own, to the greater enjoyment of all passers-by. It’s reported that there will be memorial services on the Cape and here in Austin sometime in April. There is an on-line guestbook in Kay’s memory. There’s much to admire about Austin and even more about Austinites. Whether being stylish in the usual sense of the word is admirable or not, though, I think that it’s one trait not all that common in every-day Austin or among its denizens. We’re currently going through a stage in which various retailers of expensive clothing and accessories try to survive here, but it’s a long shot. We’re just more practical than that, and we care less about the expectations of others. Sears, Penney’s, and Academy sell the clothes worn by many State and City workers, schoolteachers, and the general run of UT employees, still a substantial segment of the population. Yes; there are some high-spending students here, but they’re not in the majority. The worn-by-others-first wardrobe is more common than not. Comfort is an extremely important attribute. Was there any day at all in March when it would have been cold enough to wear something that “cool”? Just wondering. And then we must ask: real or synthetic? It’s unclear from the photograph. Only her pelt-purveyer knows. The gullible among us may look forward to the day when every head in Austin is adorned with one of these, with the entire nation soon to follow Austin’s lead, especially in the summertime. Especially with tortoise-shell sunglasses perched jauntily atop the headgear. Twitter really caught fire, though, at the South by Southwest music and digital conference, held Mar. 9-18 in Austin, Tex. Obvious cleverly prepared the ground, setting up two 51-inch plasma screens next to the conference registration desk and in a hallway where panels let out. As the techie crowd milled around, they began paying attention to the scrolling updates from bloggers about hot parties, panels, and restaurants. “You would go into a panel room and 20% of the people would be staring at their phones, sending out or getting updates,” says Narendra Rocherolle, an early Twitter user. The Twitter FAQ page is a bit on the enigmatic side. I know there are at least two Austin Metbloggers on Twitter and I’m not one. Can anyone who’s a member say what prompted you to join? Do you plan to stick with it? Anybody? These are just two of the adjectives employed in a feature called “Austin Power: In Quest for Cleaner Energy, Texas City Touts Plug-In Car” (today’s WSJ, byline John J. Fialka). This is a long front-page feature and may require sign-in. Prominent in the story are Will Wynn and Roger Duncan. Plug-In Partners is touted. The City’s electric utility company devotes much Web space to promoting this scheme. It appears that PHEV (plug-in hybrid electric vehicle) will be an oft-employed acronym in 2007. We’ll be seeing more of “V2G” under discussion, as well; “vehicle to grid” is envisioned as a means of drawing stored electricity from idle plugged-in vehicles. Eight thousand individuals and companies are said to have signed pledges to acquire a PHEV when they become commercially available. I always think that I read the local daily fairly closely, but I missed this one: the article reports that in 2006 the city council voted to spend $1 million “to mount a national campaign to drum up support” for plug-in cars. Mr. Duncan, who’s with the electric utility company these days, was sent on the road with a PowerPoint presentation. I’ve missed this one, too: Wynn told the WSJ reporter that the city council “has already set aside $1 million to fund rebates for the first 1,000 residents to buy plug-ins.” Rebate or no, I think we’ll be sticking with our current household vehicle, which uses an entire tank of gas about every three weeks. Adam gets a nice shot of one of the new USPS R2D2 mailboxes that are being rolled out in celebration of the 30th anniversary of Star Wars. It looks like it might be on the northwest corner of Congress and 4th? podcasts. SXSW is also posting video from the conference. I didn’t see any films. I heard King of Kong was awesome. Here’s a small sampling of some of the things that I’ve seen posted over the past week or so that I think are worth checking out. I missed Dorkbot. I hear that they had a line around the block. Make has some video and a recap and BBC’s Digital Planet was there as well. Dylan from the Seattle Metblog posts from SXSW. The Register did a roundup of SXSWi, complete with the one other thing besides Twitter that I couldn’t seem to escape this year…those two dudes dressed like Superman and Hulk. 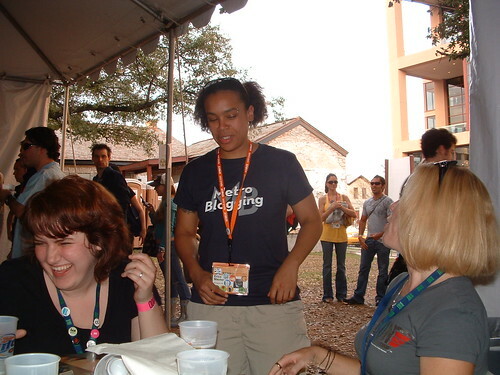 Matt Dentler, a SXSW Film organizer has roundups of SXSW in the news, part one and part two. the fire marshals with a long comment thread and a post speculating about the death of the afterparty, but I can’t link it at the moment because they’re inaccessible for some reason (it appears Austinist had some issues over the weekend). Louis Black does his own recap in an editorial in this week’s Austin Chronicle. SXSW Baby has the dates for next year. Armed Forces Entertainment returned to SXSW for the second year in order to scout for music to please U.S. military audiences. Today’s WSJ reports that last year’s foray was the success that spurred this year’s return (“Rock in a Hard Place,” byline John Jurgensen). Austin-related artists signed to tour Iraq and Kuwait military installations include Charlie Robison and Kevin Fowler (the “Beer, Bait & Ammo” favorite). >>> Rue’s Antiques wasn’t there on the 1500 block of South Congress forever, but it was there for a good long time. Yesterday, everything was auctioned off; a peek through the windows this morning revealed some mighty wide-open spaces. I never bought anything from Rue’s but I sold items to Rue’s, and this business offered certain repair services and could offer referrals to others. Was it rent? Retirement? Some bar or restaurant offering more money? If there was anything in the local daily about this, I missed it, and nobody I’ve asked seems to know. Other business people on the Avenue probably do know, but they weren’t open yet early this morning. If the auction hadn’t been on a weekday, it would have been an attraction. I remember the one at The Tropic Shop, just over the Congress bridge on the south side (now Your Living Room), which was especially rich in the oak chairs that used to be seen everywhere in court houses, sometimes known as Bank of England chairs. Thank you, Rue’s. >>> Now that the May 12 election season is just over the horizon, Travis County once again offers ways to make your voter registration really pay off, with an array of full- and part-time temporary jobs paying the kind of money we expect here in Austin. An application form may be downloaded. A call to 854-4996 will yield more information about these jobs paying $10 and $13 per hour. Openings include these: call center reps (varying hours; $10 per hour; during early voting, which this year is from April 30 through May 8); ballot-by-mail clerks ($10); election trainers ($13 per hour); technical troubleshooters ($13 per hour; test required); bilingual workers for long hours on Election Day only (training session before Election Day; mostly $10 per hour, but some $9); and night workers to receive ballots at one of five locations on Election Day after the polls close ($6 per hour). I’ve seen these postings only in summary form; more complete descriptions are no doubt available at the county clerk’s election division, 5501 Airport Boulevard. Applicants must be 18 or over, registered to vote in Travis County, and able to pass a criminal-background check. We may live in booming, prosperous Austin, but these jobs usually go fast, perhaps because of high politico quotient. Asti Trattoria, one of my top 3, if not my very favorite restaurant in Austin, is joining with Dolce Vita, Hyde Park Bar & Grill, Fresh Plus, Julio’s, Quack’s Bakery, and Pronto Food Mart to support their fellow neighborhood business, Mother’s Cafe & Garden, after the beloved vegetarian restaurant’s garden was destroyed by a fire two weeks ago. Part of these businesses’ proceeds on MONDAY, MARCH 26 (as in this Monday) will go towards the waitstaff and other Mother’s employees who are out of work at the moment- many uninsured. This is a perfect excuse to fill up on delicious food (or groceries) for a great cause! Asti will even be serving a vegetarian menu in honor of Mother’s featuring Beet Risotto with Boggy Creek Farm Beets, Horseradish Creme Fraiche & Poppyseeds, Chicory Salad from Boggy Creek Farm with Roasted Apples & Goat Cheese Dressing, and more! Besides, everyone knows calories don’t count if it’s for charity! Posted in Food | Comments Off on Mother’s Day comes early! Since there were so many possibilities for a meetup during SXSWi, I decided to declare Nuclear Taco the Metroblogging Meetup location for this year. I’ve always meant to attend and never made it over there. I missed this last week in the SXSW frenzy, but apparently Ted Nugent taped an episode of Texas Monthly Talks this morning down at the KLRU studios on the UT campus. Did anybody see him? That’ll be interesting. Evan Smith, the show’s host and editor of Texas Monthly, is sure to ask him about his governor’s ball performance earlier this year. I did a quick check of the schedule for that show on KLRU and it doesn’t look like it’ll air until at least early May. I’ll definitely have to make a note to watch for that one.